Is human hair used to make bread? Is this something that actually happens on a regular basis or is it just one of possible ways to create L-cysteine? Yes and no, if you are making your own Sourdough bread then I would say no, as you have created the starter and the yeast is all natural. However if you are buying shop bought bread then one of the ingredients to extend the shelf life of the bread is L-cysteine. 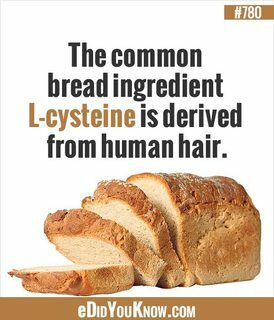 L-cysteine is/can be derived from human hair(mostly from barbers in china apparently), and please note it is not only be bread that L-cysteine is added too. Not the answer you're looking for? Browse other questions tagged consumer-products cooking . Can you make yogurt with cultures from ant-eggs? Does high dryer heat shrink clothes? Did the ancient Egyptians call aloe vera “the plant of immortality”? Can a person submerge their hands in hot frying oil without adverse effects?